The Viking Cooking School may be the most enjoyable school on earth - even the homework is fun. From the novice to the experienced cook, thousands of students including kids, moms and dads, business professionals, and others come alone, or together with friends to attend our classes each year. If you love to cook, entertain, or just appreciate the pleasure of great food, the Viking Cooking School is the place to indulge your passions. You can expect the same type of performance from our teachers as you would a Viking range. Our culinary spirit keeps us on the cutting-edge of all things food and inspires us to constantly evolve our menus with the seasons and current cooking trends. Select from our wide array of exciting classes covering subjects such as ethnic cuisines, basic techniques of cooking, baking, vegetarian, and cocktail and dinner parties, whatever you choose, we'll make sure you have a blast. After experiencing the exceptional performance of our Viking Range equipment in your cooking class, you may be inspired to update your own kitchen. Our trained Appliance Specialist at the Viking Cooking School would be happy to help you with selecting all the products you will need to complete your dream kitchen! Contact the Viking Retail Store at 866.451.6750 or thevikingcookingschool@vikingrange.com for all your cooking needs. You take care of the guest list, and we’ll handle the rest. Whether you’re thinking about a unique team building exercise for your employees, trying to find just the right place for a birthday celebration, or looking for a stress-free way to throw a dinner party - the Viking Cooking School has the ingredients to make your next event unforgettable. For a complete listing of our special event menus or to schedule your private event, contact the Viking Cooking School at 866.451.6750 or 662.451.6750. I love to cook and this class was a blast! A great weekend get away with the wife! If cooking is everything, then the complete Viking kitchen is everything you need. From cooking to cleanup to refrigeration - Viking delivers the ultimate in performance and design. Now available through the Viking Cooking School in a variety of colors and sizes to build any chef's dream kitchen. What else could you ask for besides more time in the kitchen? Anytime you need a particular piece of equipment, you are sure to find it at the Viking Retail Store, conveniently located across the street from The Alluvian Hotel. At the Viking Retail Store every piece of cookware, cutlery and countertop appliance feels like it belongs on, in, or near a Viking range. Our wide array of kitchen gadgets is the same caliber you would find in the world's finest restaurant kitchens. 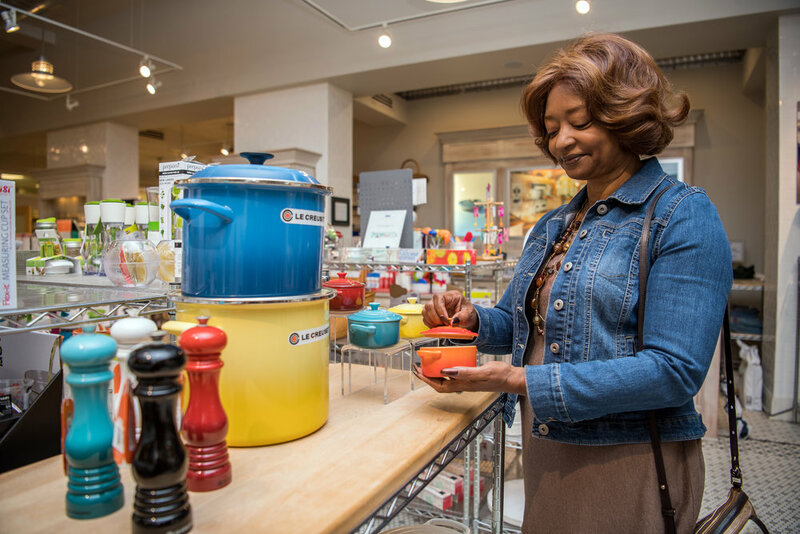 You will find everything you need for kitchen entertaining at our retail store, from gourmet foods to our barware selections. Included in this vast retail area is the very popular luxurious Alluvian linens and bedding. In addition, Viking appliances are now available through the Viking Retail Store. With the help of our Appliance Specialist, you can build your own Viking dream kitchen! The Viking Retail Store is open Tuesday - Saturday from 10:00am - 5:30pm. Contact the Viking Retail Store at 866.451.6750 or thevikingcookingschool@vikingrange.com for all your cooking needs. Gift cards are available in any amount. Available online, in-store or by phone at 662-451-6750. Click here for tips and information to help you prepare and make the most of your visit to the Viking Cooking School.